Bone is the second most transplanted tissue and due to its complex structure, metabolic demands and various functions, current reconstructive options such as foreign body implants and autologous tissue transfer are limited in their ability to restore defects. Most tissue engineering approaches target osteoinduction of osteoprogenitor cells by modifying the extracellular environment, using scaffolds or targeting intracellular signaling mechanisms or commonly a combination of all of these. Whilst there is no consensus as to what is the optimal cell type or approach, nanotechnology has been proposed as a powerful tool to manipulate the biomolecular and physical environment to direct osteoprogenitor cells to induce bone formation. Review of the published literature was undertaken to provide an overview of the use of nanotechnology to control osteoprogenitor differentiation and discuss the most recent developments, limitations and future directions. Nanotechnology can be used to stimulate osteoprogenitor differentiation in a variety of way. We have principally classified research into nanotechnology for bone tissue engineering as generating biomimetic scaffolds, a vector to deliver genes or growth factors to cells or to alter the biophysical environment. A number of studies have shown promising results with regards to directing ostroprogenitor cell differentiation although limitations include a lack of in vivo data and incomplete characterization of engineered bone. There is increasing evidence that nanotechnology can be used to direct the fate of osteoprogenitor and promote bone formation. Further analysis of the functional properties and long term survival in animal models is required to assess the maturity and clinical potential of this. Keywords: Nanofibre, Nanomaterials, Nanoparticles, Nanoscaffolds, Nanotechnology, Osteogenic differentiation, Osteoprogenitor cells. Bone is the second most transplanted tissue after blood with 2.2 million bone grafts performed annually . Correction of congenital critical sized bone defects (e.g. midface hypoplasia in Treacher Collins syndrome) or acquired skeletal defects (e.g. due to trauma or neoplasia) often require the use of vascularized or non vascularized bone grafts with/without associated soft tissue. Reconstruction of bone defects with foreign body implants (either used as a prosthesis or as a scaffold for bone growth) contains the risk of infection, extrusion and inability to grow or fully integrate with the rest of the skeleton. Whilst, autologous bone transfer bypasses many of the complications associated with foreign body implants, there is the risk of absorption and donor-site morbidity. There is also a limit to the amount of tissue that can be harvested. Due to the risks and limitations of reconstruction of defects with foreign body implants and autologous bone transfer, tissue engineering provides the promise of generating autologous bone tissue without many of the limitations and morbidities associated with the gold standard treatment. Osteoprogenitor cells are stem cells capable of differentiation down the osteogenic lineage into osteoblasts . They can be derived from mesenchymal stem cells (MSC) found in a variety of endogenous locations including the bone, bone marrow, periosteum, adipose and even muscle, which are capable of differentiation along the adipogenic, chondrogenic and osteogenic line (Fig. 1). Although they express the general markers of pluripotency such as CD44, CD90, CD105 and CD166 [3, 4], the sub-populations that have greatest osteoprogenitor potential have been shown to also express STRO-1, SB-10 and HOP-26 [3-5]. Other sources of osteoprogenitor cells include embryonic , amniotic fluid  and induced pluripotent stem cells . In order for new bone formation to occur, osteoprogenitor cells must be recruited through a complex and highly regulated interplay between signalling from the systemic and local biomechanical as well as biophysical environment  (Fig. 2). These signals co-ordinate activation and maturation of the osteoprogenitor cells giving rise to osteoblasts which in turn produce and lay down the extracellular bone matrix . Additionally, the role of the musculoskeletal unit (bone-tendon-muscle) provides an important biomechanical stimulus which regulates normal bone development and maintenance . Differentiated bone is characterized by upregulation of genes and protein expression of early markers such as collagen I and alkaline phosphatase (ALP) and late markers such as osteopontin (OSP) and osteonectin (OSC). Alkaline Phosphatase (ALP) enzyme activity is frequently used in assays to verify bone formation. Also the amount and pattern of calcium deposition (mineralization), extracellular matrix composition and mechanical properties can be used to demonstrate the stage and maturity of the osteogenesis. Embryonic, foetal and adult tissues can give rise to multipotent/pluripotent stem cells from which osteoprogenitor cells can be derived. As a tissue, bone is complex as it has a mechanical, haemopoeitic and metabolic functions. It provides structure and protection to surrounding soft tissues and is necessary for metabolic regulation of calcium and phosphate as well as haemopoeisis. Additionally, the structure and function for each bone is highly site-specific and related to its embryological origin as well as its ability to adapt (e.g. the weight-bearing long bones which are of mesenchymal origin and facilitate locomotion compared with the neural-crest derived flat bones of the face which provide support and structure). Bone is composed of a cellular and acellular component . The latter constitutes 80% of the overall bone mass. Osteoblasts, osteocytes, osteoclasts and osteoprecursor/osteoprogenitor cells comprise the cellular constituents . There is extensive cross-talk between these cells which in concert regulate bone remodeling  (Fig. 2). Osteoblasts promote bone formation and mature into osteocytes which act as mechanosensors, control mineral haemostasis and regulate both osteoclast and osteoblast function . This provides a balance between osteoblast mediatied bone formation and osteoclastic resorption in response to the environment. The acellular components are predominantly collagen I and extracellular matrix proteins as well as minerals such as hydroxyapatite. The acellular components together provide a scaffold to support cells structurally as well as facilitate their growth, proliferation, differentiation and signalling. Due to the multifunctional nature of bone, it is also richly vascularised. Any attempt at bone tissue engineering must therefore address the multipurpose nature of bone and its metabolic requirements as well as its complex structure. Under the influence of physical, chemical and biological stimuli osteoprogenitor cells can be encouraged to undergo osteogenic differentiation giving rise to osteoblasts. Depending on signaling, osteoblasts can be induced to lay down extracellular matrix and eventually mature into osteocytes or contribute to remodeling by activating osteoclasts to help in resorption of bone. To date, many different approaches have been taken to attempt bone tissue engineering using osteoprogenitor cells. In general, the focus has been on finding the optimal stimulus and scaffold to provide osteogenic induction, maintenance of differentiation and structural support. Many studies have provided evidence for promoting osteoprogenitor osteogenic differentiation using growth factors such as BMP-2 , FGF-2 [16, 17] and VEGF , genetic modification , co-culture with other cells  and using mechanical stimulation such as pulsed electromagnetic fields . The field of scaffold research to promote osteogenic differentiation is also vast but the overall aim of the scaffolds is to promote cell adhesion, survival and osteogenic differentiation. Additionally, some scaffolds have been optimized to support vascularization, provide mechanical stimulation or deliver growth factors. The most sophisticated scaffolds attempt to recreate the extracellular matrix and stem-cell niche [22, 23]. A wide-variety of different scaffolds have been proposed for bone tissue engineering ranging from natural materials such as collagen  and fibrin  to synthetic biomaterials in the form of polymers  and bioactive ceramics . Each of these scaffolds has advantages and disadvantage for its use for bone tissue engineering (Table 1). Due to the complexity of bone with respect to structure, function and metabolic requirements as well as a need to tissue engineer bone rapidly due to the large-scale therapeutic demand, combinations of these scaffolds can yield the best results. Composite scaffolds could provide the biomimetic properties of the extracellular matrix bestowed by natural scaffolds such as hydrogels whilst possessing the mechanical strength, mass production and ease of surface modification that the synthetic scaffolds provide. Nanotechnology can be broadly defined as the science and technology which allows the manipulation of matter on an atomic or molecular scale to produce new structures, materials or devices which are between 1-100 nanometers in at least one dimension . At this scale, manipulation of these materials or devices allows control of the macroscopic physical, biological and mechanical properties . These technologies can also interact with the body on a molecular level thus providing the potential for targeted therapies with high efficiency and reduced side effects. Carbon nanotubes and nanoparticles are amongst the most frequently studied nano devices for bone tissue engineering . Nanotechnology provides the tools to generate scaffolds that combine the mechanical strength and biological molecules required to optimize osteoprogenitor differentiation. It also allows surface modification to alter nanotopography and architecture which helps promote cell migration, survival and proliferation. Scaffolds can also be generated in a reproducible manner with rapid-prototyping and mass-production possible . Additionally, nanotechnology has been used to engineer nanoparticles which target cells and modify their behavior by delivering genes or biophysical stimuli . This review will provide an overview of the use of nanotechnology to control osteoprogenitor differentiation and discuss the most recent developments, limitations and future directions. There are a number of potential applications for nanotechnology in bone repair which include delivery of pharmaceutical agents such as growth factors to stimulate bone repair, as a stand-alone implant to mimic the mechanical and structural support afforded by bone or to support bone tissue engineering . The control of osteoprogenitor differentiation can be targeted by using nanotechnology to stimulate osteoinduction of local cells (e.g. at the site of a fracture), as a carrier to prime and deliver stem cells to reconstruct an area of bone loss or as a scaffold to tissue engineer bone prior to implantation for reconstruction of a bone defect. Additionally, nanotechnology can be used to modify scaffold properties in order to influence cell fate. Reviews undertaken to date, have addressed each of these applications separately. In a review of nanotechnology in bone tissue engineering, Kim et al. presented the evidence for the use of nanoparticles to promote osteogenic differentiation through fabrication of scaffolds that support cells, provide mechanical strength to support bone formation and for the delivery of genetic material encoding growth factors . Makhdom et al. reviewed the use of nanomaterials to provide mechanical support and encourage cell migration to surgically created bone defects in distraction osteogenesis . In a wider review of biomimetic scaffolds, Motamedian et al. discussed studies relating to various modifications of polymer scaffolds including the addition of nanoparticles to stimulate osteogenic differentiation of mesenchymal derived osteoprogenitor cells as well as osteoblasts by mimicking the properties of the extracellular matrix . This review will provide an overview of the latest evidence for the use of nanotechnology to promote osteogenic differentiation of osteoprogenitor cells and support bone tissue engineering either indirectly as a carrier of osteogenic factors and to modify scaffold biophysical properties or directly as an osteoinductive scaffold. Nanotechnology has been used to generate implants that mimic the inorganic component of bone in order to encourage migration, proliferation and osteogenic differentiation of osteoprogenitor cells and thus enhance the body’s regenerative potential. Minardi et al. demonstrate this by using a nanocrystalline magnesium-doped hydroxyapatite particle/type I collagen composite scaffold which was designed to mimic the microarchitecture and biomechanical properties of trabecular bone extracellular matrix . This nanocomposite scaffold demonstrated similar microarchitecture to trabecular bone when compared using X-ray diffraction (XRD), infrared spectroscopy and scanning electron microscopy (SEM). Nanomechanical properties also compared favourably to bone when compared using atomic force microscopy (AFM). They were able to promote osteogenic differentiation of human bone marrow derived stem cells on these scaffolds, which was evidenced by upregulation of osteogenic genes such as alkaline phosphatase when compared with cells grown in collagen scaffold alone or plastic monolayer. They then implanted the unseeded scaffolds subcutaneously in rabbits which prompted ectopic bone formation at this site on CT scan. The time range for the in vivo study was 24 hours-6 weeks. The latter time points (4 and 6 weeks) show both trabecular and corticle bone formation (the majority being trabecular). Based on the in vitro and in vivo results, the authors suggest that these constructs provide an acellular “stem cell niche” for osteoinduction. Whilst these results are promising, there are some limitations. The in vitro work compared survival, proliferation and osteogenic differentiation of Bone marrow derived stem cells on the nanocomposite scaffolds, collagen scaffolds and 2D culture but for a one week period only. This short time-frame has not have provided an opportunity to determine the scaffolds’ ability to maintain differentiation and cell survival in the long term. Additionally, the in vivo work determined the scaffolds ability to recruit local cells to induce bone formation. However, they do not characterise what this cell population is nor do they analyse the biological or mechanical properties of this ectopic bone. Another limitation of this study is that the in vivo model is not clinically translatable as they show ectopic bone formation when implanted subcutaneously rather than to reconstruct a bone defect. Nanofibres have also been used as vesicles to deliver stimuli to promote osteogenic differentiation of precursor cells. Gulseren et al. developed nanofibres which mimic the enzymatic activity of alkaline phosphatase . In their study, these self-assembling peptides were able to induce osteogenic differentiation of human osteosarcoma and rat mesenchymal derived stem cells (as evidenced by up regulation of bone markers such as collagen I and osteopontin as well as bone nodule formation) when cultured on surfaces coated with these peptides. Promisingly, they showed that the rat mesenchymal stem cells differentiated into osteoblast on the coated surfaces without any additional osteogenic differentiation supplements. They also created a gel from these peptides and used it as a scaffold to support 3D culture which demonstrated similar results. Whilst this data suggest that these nanopeptides can be used to generate an osteoinductive scaffold capable of supporting osteogenic differentiation. The limitations of this study is that it is in vitro only, uses rat mesenchymal stem cells and do not look at the architecture or mechanical properties of this tissue engineered bone. In another study by Sever et al., self-assembling peptide nanofibres incorporating fibronectin were used to mimic the extracellular matrix and promote osteogenic differentiation of rat derived mesenchymal stem cells in vitro . Similarly, whilst this study shows that self-assembling nanopeptides can direct Osteoprogenitor differentiation alone the limitations include that it is an in vitro study on rat cells and only looks at mineralisation and gene expression to verify osteogenic differentiation. Gene delivery is another potential use of nanotechnology in order to deliver osteogenic stimuli to osteoprogenitor cells. The nanomaterial Polyethylenimine-conjugated chitosan was used as a vector by Yue et al. to transfect bone marrow stem cells with the BMP-2 gene and thus promote osteogenic differentiation which was evidenced by both alkaline phosphatase activity and mineralisation assay . The authors suggest that this nanomaterial has future potential for use in gene therapy. The limitations of this study are that they used mouse stem cells only and that it was on monolayer culture. This application of nanotechnology was also demonstrated in an in vivo mouse model of a calvarial bone defect by Itaka et al. . They used Polyplex nanomicelles that were released from a calcium phosphate scaffold to transfect osteoprogenitor cells with caALK6 and Runx2 genes and thus promote osteogenic differentiation. Similar to the study by Yue et al. , there was good transfection efficiency with little cytotoxicity. Whilst this in vivo study shows potential for the use of nanotechnology as a non viral vector for delivering osteogenic genes, it is limited by the fact that the bone formation was only evaluated biologically and no with respect to architecture or mechanical properties. Growth factor delivery is an additional use of nanotechnology to promote bone formation. Levy et al. used iron oxide nanoparticles coated with human serum albumin and conjugated with FGF-2 to deliver this growth factor to human bone marrow derived stem cells . These cells exhibited greater osteogenic differentiation compared with those cultured in the growth factor alone. This conjugation was also shown to encourage neurogenic and adipogenic differentiation of the same cells hence reducing the sensitivity of this method for achieving osteogenic differentiation. Low molecular weight Protamine peptide nanoparticles were also used to successfully deliver a transcriptional coactivator intracellularly to human mesenchymal stem cells by Suh et al. . This induced osteogenic differentiation in vitro which was shown by upregulation of osteogenic genes and mineralisation. Implantation if these cells in an alginate gel in a rabbit cranial defect yielded bone formation on histology and micro CT scanning. Whilst promising, these results are limited by a lack of assessment of the mechanical properties of the bone formed in vivo. The qualities that make nanomaterials particularly suited for use as a scaffold in bone tissue engineering include mechanical strength, biocompatibility, controlled biodegradation, an easily modifiable surface and porous structure which can promote cell proliferation and vascularisation . Nanotechnology has been used to enhance bone tissue engineering through the creation of nanoscaffolds or by combining with pre-existing natural or synthetic scaffolds to mimic the biomechanical environment required to differentiate osteoprogenitor cells. Nanoscaffolds can be developed using electrospun nanofibres or self-assembling nanoparticles. Nanofibres have been proposed as a suitable scaffold for bone tissue engineering because they can mimic the structure and nanotopography of the extracellular matrix. Polycaprolactone (PCL) electrospun nanofibres have been shown to enhance osteoprogenitor differentiation. Human mesenchymal stem cells were driven down the osteogenic lineage by Binulal et al. on nanofibre PCL scaffolds. These exhibited greater levels of osteogenic differentiation on analysis of alkaline phosphatase activity, upregulation of ALP and OSC gene expression as well as mineralisation when compared with microfiber scaffolds in vitro . Electrospun PCL nanofibres were also used by Cheng et al. to generate a collagen I-Chitosan-PCL nanocomposite scaffold. Culture of rat bone marrow derived stem cells on these scaffolds enhanced osteogenic differentiation as evidenced by upregulation of ALP activity, increased mineralisation and the osteogenic markers ALP, OSP and OSC . Both of these in vitro studies are limited by the fact that analysis of the osteogenic differentiation did not include architecture or mechanical function. Self-assembling nanoparticles have been used to generate scaffolds which can mimic the biophysical properties of the bone extracellular matrix. In a study by Yang et al., a nanocomposite scaffold was fabricated using a self assembling matrix of silk-derived protein and hydroxyapatite nanoneedles which promoted survival and successfully drove osteogenic differentiation of human bone marrow derived stem cells . Although the authors suggest that these scaffolds are biocompatible and osteoinductive, the culture period was short (5 days) and osteogenic differentiation was only assessed by ALP activity and mineralisation. A longer time period and in vivo study would provide more information regarding long term survival and behaviour of these cells whilst biological, architectural and mechanical analysis is required to assess the maturity and quality of tissue engineered bone. Nanoparticles can be combined with synthetic polymers such as polylactic acid (PLA), polyglycolic acid (PGA), polylactide-co-glycolide (PLGA) and PCL or natural materials such as proteins, alginate, silk and chitosan to fabricate nanocomposite scaffolds which possess the above desirable biomechanical characteristics in order to optimise osteogenic differentiation of osteoprogenitor cells. One such example is the incorporation of graphene oxide nanoflakes into gelatin-hydroxyapatite which when used as a scaffold by Nair et al., promoted the osteogenic differentiation of human adipose derived stem cells without the need for addition of differentiation media . They looked at the proliferation and survival of these cells for three weeks and demonstrated osteogenic differentiation through ALP assay and cell morphology on scanning electron microscope. Although they conducted tests on the mechanical properties of the scaffolds which revealed increased strength when graphene oxide flakes were incorporated, they did not show whether culture of cells on the scaffolds affected these properties. Nanocomposite scaffolds which combined porous poly lactic acid-co-polycaprolactone/silk fibroin/ascorbic acid/tetracycline hydrochloride and nanohydroxyapatite were shown to mimic the extracellular bone matrix and initiate osteogenic differentiation of human mesenchymal stem cells by Gandhimathi et al. . After a three-week culture period, osteogenic differentiation was evidenced by increased ALP activity, mineralisation and upregulation of OSC gene expression. They also used SEM to visualise the extracellular matrix deposited by these differentiated cells. Although, they conducted mechanical tests on the scaffolds and showed increased strength, this was not performed with the cells cultured on them. Nanoceramics have also shown promise in bone tissue engineering. These properties are detailed in a review by Gao et al. who conclude that this is due to their ability to form direct bonds with bone when implanted into a defect . They can mimic the extracellular matrix, have good bioactivity, biodegradability, biocompatibility and allow controlled degradation . Human adipose and bone marrow derived stem cells were induced to undergo osteogenic differentiation on a Zr-Si organic-inorganic porous nanoindented bioceramic scaffold by Koroleva et al. . These cell-scaffold constructs demonstrated mature bone formation evidenced by expression of late markers of osteogenic differentiation (osteocalcin) and mineralisation in the absence of osteogenic differentiation media. They also demonstrated extracellular matrix deposition on SEM and conducted mechanical testing of the scaffolds with and without culture of cells. These results showed that these nanoindented ceramics directed osteoprogenitor cell differentiation into mature bone tissue formation as evidenced by biomechanical testing. The main limitation of this study is that it was in vitro. Nanoceramics can also interact with growth factors to induce osteogenic differentiation of precursor cells. Lu et al. incorporated bioactive glass nanoparticles into a polycaprolactone coating on a hydroxyapatite/β-tricalcium phosphate scaffold and demonstrated that this had a synergistic effect on the actions of BMP-2 which was separately added to adipose derived stem cells in vitro . Differentiation down the osteogenic lineage was demonstrated by upregulation of osteogenic genes, ALP activity and SEM images of extracellular matrix deposition. They also analysed protein expression and suggested that these scaffolds caused osteoinduction through increasing Wnt signalling which in synergy with BMP-2 signaling resulted in osteogenic differentiation of the cells. This study provides a good model of the interplay between environmental queues, scaffolds and signalling pathways in orchestrating osteogenic differentiation of osteoprogenitor. Cell migration, adherence, survival and differentiation can be enhanced and directed using nanopatterning to alter scaffolds. Whilst titanium has been suggested as a scaffold for bone tissue engineering due to its mechanical and morphological similarity to trabecular bone , Tan et al. demonstrated that nanopatterning of these scaffolds with chemical oxidation improved mouse bone marrow derived stem cell osteogenic differentiation evidenced by increased alkaline phosphatase expression and mineralisation . They hypothesise that nanotechnology can be used to alter titanium implant surface topography and chemical properties in vivo to enhance osseointegration of implants although the study only assessed in vitro outcomes. They also only assessed the mechanical properties of the unseeded scaffolds. This is supported by the work of Mendonça et al. who found that nanostructuring of titanium surfaces with H2SO4/H2O increased adherence and upregulation of osteogenic genes of human mesenchymal stem cells when compared with smooth titanium and microstructured titanium surfaces . Interestingly, the effect of topography on murine osteoprogenitor cells was further characterised on smooth, micro- and nanopatterned titanium surfaces by Ogino et al. . The authors found that cells cultured on smooth and microstructured Titanium surfaces behaved differently than those on nanopatterned titanium surfaces when the main intracellular signalling pathway regulating cell adhesion, spreading, migration and osteogenic differentiation was activated by RhoA. This study found that pharmacological blocking of RhoA affected adhesion and behaviour of cells on smooth and microstructured surfaces but not on scaffolds with nanopatterned surfaces thus suggesting that nanotopography may result in cells using alternate signalling pathways to mediate adhesion, migration and osteogenic differentiation . Further evidence of the influence of nanotopography on cell biology was provided by Jimbo et al. who evaluated the impact of nanostructured calcium phosphate-coated titanium implants on osseointegration of the implant in a rabbit defect model . Coated titanium implants demonstrated upregulation of ALP and Runt-2 with downregulation of tumour necrosis factor-α suggesting increased osteoprogenitor activity and reduced inflammation at 2 weeks of implantation. At 4 weeks, they found further upregulation of osteogenic genes and interestingly upregulation of markers of osteoclast activity in the coated implants. This alongside analysis of conventional removal torque suggested progressive mineralisation of bone around the implants and resorption of the coating by Osteoclast. Unfortunately, the significance of this coating with respect to long term osseointegration of the implant is not evident due to the short time course (2 and 4 weeks) of the in vivo implantation. The importance of nanotopography in controlling stem cell fate was also demonstrated by Ahn et al. who through altering nanopost density of polyurethrane scaffolds were able to encourage human mesenchymal stem cells to undergo adipogenic or osteogenic differentiation depending on the spatial arrangement . This study gives an important insight into the role of nanotopography in controlling osteoprogenitor differentiation through manipulating cystoskeletal structure and intracellular signalling. Whilst further in vitro and in in vivo work is needed, it provides the potential for developing biphasic scaffolds capable of differentiating cells into different tissue types. This could eventually be useful in tissue engineering cartilage and bone for reconstructing joints. It is increasingly acknowledged that the physical environment plays a crucial role in determining stem cell fate in the case of osteogenic differentiation. Ribeiro et al. recently demonstrated that polymer scaffolds which provided dynamic piezoelectric stimulation optimised osteogenic differentiation of human adipose derived stem cells in vitro . Nanotechnology can be used to generate a mechano-physical environment which will influence osteoprogenitor differentiation. Whilst verification of osteogenic differentiation was limited to ALP activity only, this study is important as it shows the importance of the biophysical environment in directing cell fate. Cho et al. used a nanoactuator to generate a piezoelectric signal on polymeric scaffolds PCL, PLGA and tricalcium phosphate. They then demonstrated that this biophysical environment stimulates human adipose derived stem cells towards osteogenic differentiation and provide tissue for repair of calvarial defects in rats . Porosity of a scaffold is also an important dictator of osteoprogenitor cell behaviour and differentiation as well as vascularisation . Nanotechnology was used by Kim et al. to fabricate a porous chitosan and nanohydroxyapatite nanocomposite scaffold. In this instant, the use of nanohydroxyapatite provided a scaffold with high porosity, uniform pore size and an increased hydroxyapatite content . Additionally these nanomodified scaffolds exhibited greater compressive strength. in vitro, this scaffold optimised osteogenic differentiation of murine calvarial-derived osteoblast precursor cells when compared with unmodified scaffolds. The limitation of this study is that analysis of osteogenic differentiation was restricted to ALP activity and mineralisation only. There was no data on architecture, matrix deposition or mechanical properties of cell-scaffold constructs. 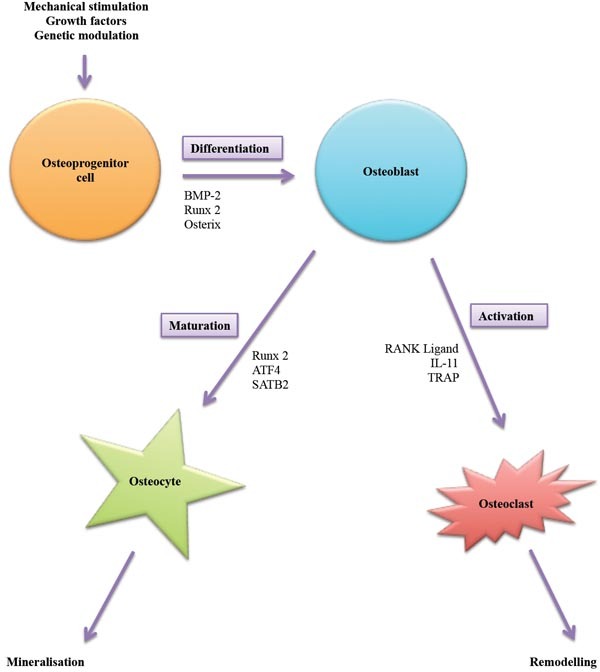 Osteogenic differentiation involves a complex and tightly regulated process of inter-, intra- and extracellular signalling (Fig. 2). A number of studies have attempted to describe the pathways through which osteogenic differentiation of osteoprogenitor cells is caused by nanomaterials. Xia et al. demonstrated enhanced osteogenic differentiation of rat adipose derived stem cells on hydroxyapatite bioceramic scaffolds which had nanotopographical features as evidenced by upregulation of osteogenic and angiogenic markers . They then showed that using an inhibitor of the AKT signalling pathway resulted in suppression of these effects. These scaffolds were then implanted in a critical sized calvarial defect in rats which again showed increased osteogenesis and angiogenesis in the micro-nano topography groups compared with smooth surface. This study however did not assess the effect of inhibition of the AKT signalling pathway in vivo. Nanotopography on titanium surfaces was similarly shown to increase osteogenic differentiation of human bone marrow derived stem cells by Kato et al. . Osteogenic differentiation of these cells on titanium with nanotopgraphy was shown to regulate a number of microRNAs, three of which are key in the SMAD-BMP-2 signalling pathways. Nanofibrous scaffolds demonstrated enhanced osteogenic differentiation in vitro and in vivo of bone marrow derived stem cells with upregulation of genes associated with the integrin-SMAD-BMP pathways. This study provides further insight into how nanomaterials induce osteogenic differentiation but this is limited to in vitro work only as the in vivo study only studied the effect of nanofibre scaffolds on bone formation in repairing a calvarial critical defect. The use of rat Bone marrow derived stem cells also limits the applicability of these findings. Both Yi and Yang demonstrate promotion of osteogenic differentiation of mesenchymal stem cells when using nanoparticles and the signalling pathways by which this occurs [59, 60]. Yi et al. found that gold nanoparticles altered MSC behaviour and resulted in activation of the MAPK signalling pathway yielding osteoblastic cells . The metallofullerine nanoparticles studied by Yang et al. were also shown to promote osteogenic differentiation of MSC which was inhibited on addition of noggin which is an inhibitor of the BMP signalling pathway. They also describe rescue of bone density in ovariectomised osteoporotic rats when these nanoparticles were used in vivo . A number of studies have explored the mechanism by which nanomaterials can promote osteogenic differentiation of osteoprogenitor cells. Depending on the type of osteoprogenitor used and application of nanotechnology, different pathways have emerged. This suggests that there is likely a complex network of signalling pathways through which nanomaterials alter cell behaviour and fate. More studies are required using human osteoprogenitor cells and also investigation of the pathways involved when nanomaterials are used in vivo. Table 1. Traditional scaffolds available for bone tissue engineering. Natural Alginate Polysaccharide (derived from seaweed) Licensed for clinical use. Available as a hydrogel or microparticle . Collagen Main extracellular matrix component of bone Easily modified through addition of growth factors. Easily combined with other scaffolds. Fibrin Fibrous protein synthesized during the clotting cascade Licensed for clinical use. Silk Protein polymer Low immunogenicity. Decellularised matrix Fabricated through decellularisation of tissues Frequently used in preclinical and clinical tissue engineering research. Preserves extracellular architecture and components. Lengthy fabrication protocols. Polyethylene glycol Polyether compound Licensed for clinical use. Polycaprolactone Biodegradeable polymer Mass producible. Easily modified to incorporate groups/motifs. Poly-l-lactic acid Biodegradable polymer Mass producible. Easy surface modification to alter topography. Natural-Synthetic composite scaffolds Alginate/O-carboxymethyl chitosan (O-CMC) Biodegradable hydrogel Mass producible. Easily injected into tissues. Rapid degradation. PLGA/hydrogel Biodegradable hydrogel Mass producible. Provides mechanical strength. Rapid degradation. Alginate/poly vinyl alcohol (PVA) Crosslinked biodegradable scaffold Available as a hydrogel or porous scaffold. Provides mechanical strength. Mimics extracellular matrix. Unstable degradation. The highly complex mechanical, metabolic and haemopoietic functions of bone means it is virtually impossible to replace with foreign body implants alone. It requires a vascular supply and thus autologous bone grafts are limited to reconstructing small defects. Vascularised bone grafts are also limited to smaller sized defects as they generate a donor site morbidity, which must be offset by the benefits of reconstruction. For this purpose, tissue engineering offers the potential to bioengineer autologous bone tissue from osteoprogenitor cells that can be harvested from a variety of different tissues. Opinion with respect to optimal cell type differs and although generally, the need for a scaffold to directly or indirectly support osteoinduction of cells is agreed upon, the type of scaffold is not. Nanotechnology can be used to guide osteoprogenitor cell differentiation in order to regenerate bone defects. The most recent reviews and studies were discussed in this paper and they demonstrate that the biophysical properties of the bone extracellular matrix can be successfully mimicked using nantoechnology in order to promote osteogenic differentiation of progenitor cells. This has been achieved by using nanoparticles and fibres as scaffolds or conjugation of nanoparticles with synthetic and natural scaffolds to generate nanocomposite structures, which can then support osteoinduction. Nanotechnology can also be used to deliver genes or growth factors to cells and thus stimulate osteogenic differentiation of the cells. We have also reviewed how scaffold strength, structure, physical properties and topography can be modified using nanotechnology to promote osteoprogenitor differentiation. The limitations of the studies have however been that most are in vitro and those in vivo were small animal studies which do not provide long term follow up. Additionally, most studies only analyses the biochemical behaviour of the osteogenically differentiated cells with a paucity of data on the mechanical and organisation/architecture of these tissue-engineered bones. Combination of these is needed to demonstrate the maturity and quality of bone formation. Further data is also required with respect to long term maintenance of osteogenic differentiation of the cells and structure of the engineered bone in vitro and in vivo during and after degradation of these biomaterials. Despite this, nanotechnology is a rapidly progressing field, which provides the tools to mimic the extracellular matrix and biophysical environment present in tissues thus allowing the tissue engineer to control proliferation, survival and fate of stem cells. This has enormous potential for clinical application in the treatment of bone disorders. Nanoparticles and nanofibres can be used to influence the migration and behaviour of precursor cells through the delivery of genes, signals or therapeutic agents to promote defect repair, increase bone density or treat disease. Nanoscaffolds can be used to promote osteogenic differentiation of precursor cells and thus provide bone for the repair or replacement of defective tissue without the need for using foreign body implants or invasive autologous tissue transfer procedures. This work was supported by the Royal College of Surgeons Research Training Fellowship (RCS Blond Fellowship). Lewandrowski KU, Gresser JD, Wise DL, Trantol DJ. Bioresorbable bone graft substitutes of different osteoconductivities: a histologic evaluation of osteointegration of poly(propylene glycol-co-fumaric acid)-based cement implants in rats. Biomaterials 2000; 21(8): 757-64. Rao RR, Stegemann JP. Cell-based approaches to the engineering of vascularized bone tissue. Cytotherapy 2013; 15(11): 1309-22. Stewart K, Monk P, Walsh S, Jefferiss CM, Letchford J, Beresford JN. STRO-1, HOP-26 (CD63), CD49a and SB-10 (CD166) as markers of primitive human marrow stromal cells and their more differentiated progeny: a comparative investigation in vitro. Cell Tissue Res 2003; 313(3): 281-90. Gronthos S, Graves SE, Ohta S, Simmons PJ. The STRO-1+ fraction of adult human bone marrow contains the osteogenic precursors. Blood 1994; 84(12): 4164-73. Green DW, Kwon HJ, Jung HS. Osteogenic potency of nacre on human mesenchymal stem cells. Mol Cells 2015; 38(3): 267-72. Mahmood A, Harkness L, Abdallah BM, et al. Derivation of stromal (skeletal and mesenchymal) stem-like cells from human embryonic stem cells. Stem Cells Dev 2012; 21(17): 3114-24. Si J, Dai J, Zhang J, et al. 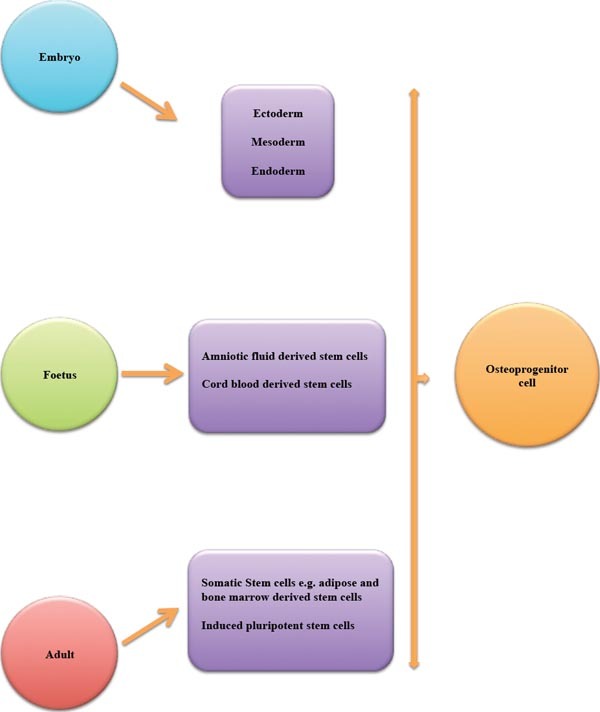 Comparative investigation of human amniotic epithelial cells and mesenchymal stem cells for application in bone tissue engineering. Stem Cells Int 2015; 2015: 565732. Ren L, Yang P, Wang Z, Zhang J, Ding C, Shang P. Biomechanical and biophysical environment of bone from the macroscopic to the pericellular and molecular level. J Mech Behav Biomed Mater 2015; 50: 104-22. Chaudhary LR, Hofmeister AM, Hruska KA. Differential growth factor control of bone formation through osteoprogenitor differentiation. Bone 2004; 34(3): 402-11. Sartori R, Sandri M. BMPs and the muscle-bone connection. Bone 2015; 80: 37-42. Lu Z, Roohani-Esfahani SI, Wang G, Zreiqat H. Bone biomimetic microenvironment induces osteogenic differentiation of adipose tissue-derived mesenchymal stem cells. Nanomedicine (Lond) 2012; 8(4): 507-15. Florencio-Silva R, Sasso GR, Sasso-Cerri E, Simões MJ, Cerri PS. Biology of bone tissue: structure, function, and factors that influence bone cells. BioMed Res Int 2015; 2015: 421746. Chen H, Senda T, Kubo KY. The osteocyte plays multiple roles in bone remodeling and mineral homeostasis. Med Mol Morphol 2015; 48(2): 61-8. Lysdahl H, Baatrup A, Foldager CB, et al. Preconditioning human mesenchymal stem cells with a low concentration of BMP2 stimulates proliferation and osteogenic differentiation in vitro. Biores Open Access 2014; 3(6): 278-85. An S, Huang X, Gao Y, Ling J, Huang Y, Xiao Y. FGF-2 induces the proliferation of human periodontal ligament cells and modulates their osteoblastic phenotype by affecting Runx2 expression in the presence and absence of osteogenic inducers. Int J Mol Med 2015; 36(3): 705-11. Kwan MD, Sellmyer MA, Quarto N, et al. Chemical control of FGF-2 release for promoting calvarial healing with adipose stem cells. J Biol Chem 286(13):-13 doi: 2011; 286(13): 11307-3. Li CJ, Madhu V, Balian G, Dighe AS, Cui Q. Cross-talk between VEGF and BMP-6 pathways accelerates osteogenic differentiation of human adipose-derived stem cells. J Cell Physiol 2015; 230(11): 2671-82. Deng Y, Zhou H, Yan C, et al. in vitro osteogenic induction of bone marrow stromal cells with encapsulated gene-modified bone marrow stromal cells and in vivo implantation for orbital bone repair. Tissue Eng Part A 2014; 20(13-14): 2019-29. Kim KI, Park S, Im GI. Osteogenic differentiation and angiogenesis with cocultured adipose-derived stromal cells and bone marrow stromal cells. Biomaterials 2014; 35(17): 4792-804. Ongaro A, Pellati A, Bagheri L, Fortini C, Setti S, De Mattei M. Pulsed electromagnetic fields stimulate osteogenic differentiation in human bone marrow and adipose tissue derived mesenchymal stem cells. Bioelectromagnetics 2014; 35(6): 426-36. Nii M, Lai JH, Keeney M, et al. The effects of interactive mechanical and biochemical niche signaling on osteogenic differentiation of adipose-derived stem cells using combinatorial hydrogels. Acta Biomater 2013; 9(3): 5475-83. Minardi S, Corradetti B, Taraballi F, et al. Evaluation of the osteoinductive potential of a bio-inspired scaffold mimicking the osteogenic niche for bone augmentation. Biomaterials 2015; 62: 128-37. Weisgerber DW, Caliari SR, Harley BA. Mineralized collagen scaffolds induce hMSC osteogenesis and matrix remodeling. Biomater Sci 2015; 3(3): 533-42. Machado eg, Issa JP, Figueiredo FA, et al. A new heterologous fibrin sealant as scaffold to recombinant human bone morphogenetic protein-2 (rhBMP-2) and natural latex proteins for the repair of tibial bone defects. Acta Histochem 2015; 117(3): 288-96. Rossi F, Santoro M, Perale G. Polymeric scaffolds as stem cell carriers in bone repair. J Tissue Eng Regen Med 2013. Saini R, Saini S, Sharma S. Nanotechnology: the future medicine. J Cutan Aesthet Surg 2010; 3(1): 32-3. Silva GA. Introduction to nanotechnology and its applications to medicine. Surg Neurol 2004; 61(3): 216-20. Bassi M, Santinello I, Bevilacqua A, Bassi P. Nanotechnology: a big revolution from the small world. Urologia 2013; 80(1): 46-55. Gao C, Deng Y, Feng P, et al. Current progress in bioactive ceramic scaffolds for bone repair and regeneration. Int J Mol Sci 2014; 15(3): 4714-32. Kim K, Fisher JP. Nanoparticle technology in bone tissue engineering. J Drug Target 2007; 15(4): 241-52. Makhdom AM, Nayef L, Tabrizian M, et al. The potential roles of nanobiomaterials in distraction osteogenesis. Nanomedicine (Lond) 2015; 11(1): 1-18. Motamedian SR, Hosseinpour S, Ahsaie MG, Khojasteh A. Smart scaffolds in bone tissue engineering: A systematic review of literature. World J Stem Cells 2015; 7(3): 657-68. Gulseren G, Yasa IC, Ustahuseyin O, Tekin ED, Tekinay AB, Guler MO. Alkaline phosphatase-mimicking peptide nanofibers for osteogenic differentiation. Biomacromolecules 2015; 16(7): 2198-208. Sever M, Mammadov B, Guler MO, Tekinay AB. Tenascin-C mimetic Peptide nanofibers direct stem cell differentiation to osteogenic lineage. Biomacromolecules 2014; 15(12): 4480-7. Yue J, Wu J, Liu D, Zhao X, Lu WW. BMP2 gene delivery to bone mesenchymal stem cell by chitosan-g-PEI nonviral vector. Nanoscale Res Lett 2015; 10: 203. Itaka K, Ohba S, Miyata K, et al. Bone regeneration by regulated in vivo gene transfer using biocompatible polyplex nanomicelles. Mol Ther 2007; 15(9): 1655-62. Levy I, Sher I, Corem-Salkmon E, et al. Bioactive magnetic near Infra-Red fluorescent core-shell iron oxide/human serum albumin nanoparticles for controlled release of growth factors for augmentation of human mesenchymal stem cell growth and differentiation. J Nanobiotechnology 2015; 13: 34. Suh JS, Lee JY, Choi YJ, et al. Intracellular delivery of cell-penetrating peptide-transcriptional factor fusion protein and its role in selective osteogenesis. Int J Nanomedicine 2014; 9: 1153-66. Binulal NS, Deepthy M, Selvamurugan N, et al. Role of nanofibrous poly(caprolactone) scaffolds in human mesenchymal stem cell attachment and spreading for in vitro bone tissue engineeringresponse to osteogenic regulators. Tissue Eng Part A 2010; 16(2): 393-404. Cheng Y, Ramos D, Lee P, Liang D, Yu X, Kumbar SG. Collagen functionalized bioactive nanofiber matrices for osteogenic differentiation of mesenchymal stem cells: bone tissue engineering. J Biomed Nanotechnol 2014; 10(2): 287-98. Yang M, Zhou G, Shuai Y, Wang J, Zhu L, Mao C. Ca(2+)-induced self-assembly of Bombyx mori silk sericin into a nanofibrous network-like protein matrix for directing controlled nucleation of hydroxylapatite nano-needles. J Mater Chem B Mater Biol Med 2015; 3(12): 2455-62. Nair M, Nancy D, Krishnan AG, Anjusree GS, Vadukumpully S, Nair SV. Graphene oxide nanoflakes incorporated gelatin-hydroxyapatite scaffolds enhance osteogenic differentiation of human mesenchymal stem cells. Nanotechnology 2015; 26(16): 161001. Gandhimathi C, Venugopal JR, Tham AY, Ramakrishna S, Kumar SD. Biomimetic hybrid nanofibrous substrates for mesenchymal stem cells differentiation into osteogenic cells. Mater Sci Eng C Mater Biol Appl 2015; 49: 776-85. Koroleva A, Deiwick A, Nguyen A, et al. Osteogenic differentiation of human mesenchymal stem cells in 3-D Zr-Si organic-inorganic scaffolds produced by two-photon polymerization technique. PLoS One 2015; 10(2): e0118164. Lu Z, Roohani-Esfahani SI, Li J, Zreiqat H. Synergistic effect of nanomaterials and BMP-2 signalling in inducing osteogenic differentiation of adipose tissue-derived mesenchymal stem cells. Nanomedicine (Lond) 2015; 11(1): 219-28. García-Gareta E, Coathup MJ, Blunn GW. Osteoinduction of bone grafting materials for bone repair and regeneration. Bone 2015; 81: 112-21. Tan G, Tan Y, Ni G, et al. Controlled oxidative nanopatterning of microrough titanium surfaces for improving osteogenic activity. J Mater Sci Mater Med 2014; 25(8): 1875-84. Mendonça G, Mendonça DB, Aragão FJ, Cooper LF. The combination of micron and nanotopography by H(2)SO(4)/H(2)O(2) treatment and its effects on osteoblast-specific gene expression of hMSCs. J Biomed Mater Res A 2010; 94(1): 169-79. Ogino Y, Liang R, Mendonça DB, et al. RhoA-Mediated functions in C3H10T1/2 osteoprogenitors are substrate topography-dependent. J Cell Physiol 2015. Jimbo R, Xue Y, Hayashi M, et al. Genetic responses to nanostructured calcium-phosphate-coated implants. J Dent Res 2011; 90(12): 1422-7. Ahn EH, Kim Y. Spatial control of adult stem cell fate using nanotopographic cues. Biomaterials 2014; 35(8): 2401-10. Ribeiro C, Pärssinen J, Sencadas V, et al. Dynamic piezoelectric stimulation enhances osteogenic differentiation of human adipose stem cells. J Biomed Mater Res A 2015; 103(6): 2172-5. Cho DW, Kang KS, Jeong YH, Hong JM, Yong WJ, Rhie JW. In vivo Biophysical-stimulation platform applied to rodent calvarial bone-defect models. J Biomech Eng 2013. Sicchieri LG, Crippa GE, de Oliveira PT, Beloti MM, Rosa AL. Pore size regulates cell and tissue interactions with PLGA-CaP scaffolds used for bone engineering. J Tissue Eng Regen Med 2012; 6(2): 155-62. Kim HL, Jung GY, Yoon JH, et al. Preparation and characterization of nano-sized hydroxyapatite/alginate/chitosan composite scaffolds for bone tissue engineering. Mater Sci Eng C Mater Biol Appl 2015; 54: 20-5. Xia L, Lin K, Jiang X, et al. Effect of nano-structured bioceramic surface on osteogenic differentiation of adipose derived stem cells. Biomaterials 2014; 35(30): 8514-27. Kato RB, Roy B, De Oliveira FS, et al. Nanotopography directs mesenchymal stem cells to osteoblast lineage through regulation of microRNA-SMAD-BMP-2 circuit. J Cell Physiol 2014; 229(11): 1690-6. Yi C, Liu D, Fong CC, Zhang J, Yang M. Gold nanoparticles promote osteogenic differentiation of mesenchymal stem cells through p38 MAPK pathway. ACS Nano 2010; 4(11): 6439-48. Yang K, Cao W, Hao X, et al. Metallofullerene nanoparticles promote osteogenic differentiation of bone marrow stromal cells through BMP signaling pathway. Nanoscale 2013; 5(3): 1205-12.